Lee Elijah in "The Return of Hwang Geum-bok"
Lee Elijah is promoting the new SBS drama "The Return of Hwang Geum-bok". 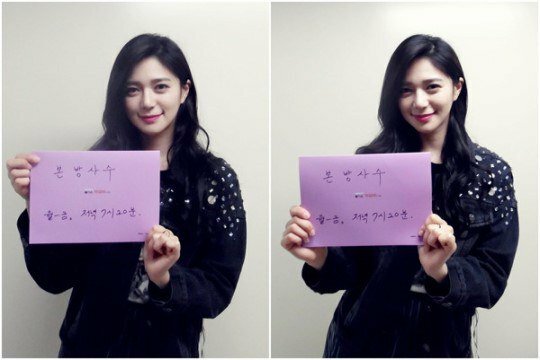 Lee Elijah posted a picture telling people to watch her drama. She posted her pictures saying, "Every Monday to Friday at 7:20PM~". Her innocent look and smiley face makes the picture look lovely. "The Return of Hwang Geum-bok" features Lee Elijah as Baek Ae-ryeong, a haughty career woman who has charisma as well. She betrays even her best friend to free herself of poverty but has a sad story no one knows about. Lee Elijah said, "I am anxious to show you Baek Ae-ryeong. We hope for your support!". Meanwhile, "The Return of Hwang Geum-bok is based on a missing mother and Hwang Geum-bok (Shin Da-eun) who searches for her mother. "Lee Elijah in "The Return of Hwang Geum-bok""
Park Seo-joon, "I meet the "Kill Me, Heal Me" cast often"
Moon Geun-yeong and Park Bo-young to star in "1 Night 2 Days"